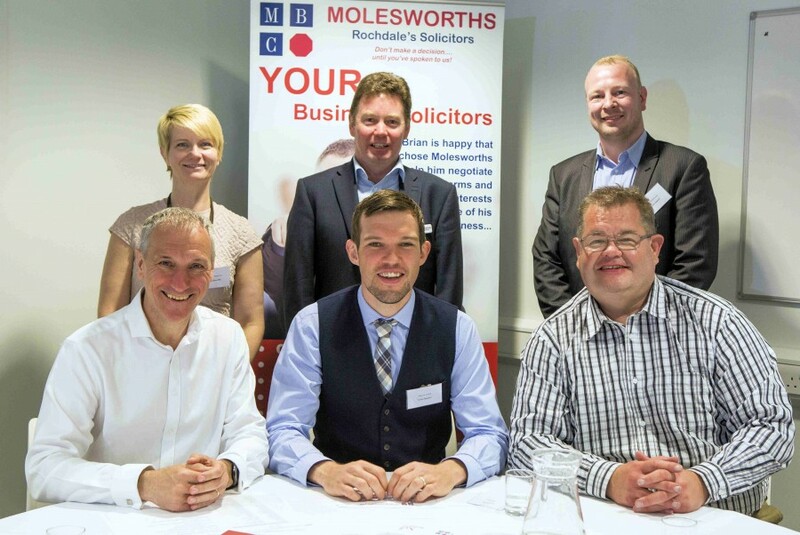 PARTNERS at law firm Molesworths welcomed eighty business guests from across the North West to their most recent business seminar and networking event. The popular business breakfasts, held at Hopwood Hall College’s Middleton Campus, are organised and delivered by the Rochdale firm to bring local business people together to network, exchange ideas and share knowledge. Event speakers included Carol Hopkins from Rochdale Development Agency, who gave an introduction to the Rochdale Business Awards. Mrs Hopkins spoke about sponsorship opportunities and the positive impact that awards can have on nominees, finalists and winners. Motivational and inspirational advice was given by dna people consultant Ian Brookes, who is a non executive director of tech company Cake Solutions in Manchester and formerly a director of Winning Pitch in Salford. Mr Brookes spoke on the topic of “Agile Thinking & Lean Scaling” which was about adopting a different approach to turning ideas into customers faster, completing tasks in bite size chunks, making marginal gains and getting to your goals faster. He emphasised the importance of thinking like your customer and creating customer intimacy. Business coach Steve Scholey gave a presentation on how to de-risk your business from the massive business disruptions ahead, in what he describes as the “age of wonder”. He spoke about the significant technological changes over the last 25 years and how quickly the business landscape is changing. He predicts that over the next 25 years more significant changes are on the way and companies need to know how to adapt and respond. Marcus Leach, an inspirational speaker, adventurer and writer gave a talk about “developing a mind-set for change and success.” He spoke about the importance of goal setting and the ability to learn lessons in defeat. He inspired and motivated the audience with tales of his adventures, challenges and transformational change over the last two years, becoming both physically and mentally fitter and now working and living his dream. Mr Leach later said: “It was a great pleasure to be invited to speak at the Molesworths Business Breakfast, and to be able to share my thoughts on creating a mindset for change and success with so many focused business owners. Events like this are a fantastic opportunity for business owners to interact and network with each other, sharing ideas and forming new partnerships for the greater good of all involved.